^ Lovdahl MJ, Perry PJ, Miller DD (January 1991). "The assay of clozapine and N-desmethylclozapine in human plasma by high-performance liquid chromatography". Therapeutic Drug Monitoring 13 (1): 69–72. ^ Bablenis E, Weber SS, Wagner RL (February 1989). 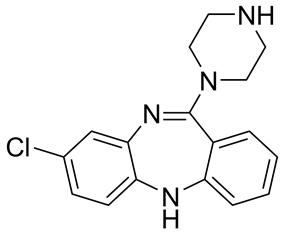 "Clozapine: a novel antipsychotic agent". DICP : the Annals of Pharmacotherapy 23 (2): 109–15. ^ Burstein ES, Ma J, Wong S, et al. (December 2005). "Intrinsic efficacy of antipsychotics at human D2, D3, and D4 dopamine receptors: identification of the clozapine metabolite N-desmethylclozapine as a D2/D3 partial agonist". The Journal of Pharmacology and Experimental Therapeutics 315 (3): 1278–87. ^ Weiner DM, Meltzer HY, Veinbergs I, et al. (December 2004). "The role of M1 muscarinic receptor agonism of N-desmethylclozapine in the unique clinical effects of clozapine". Psychopharmacology 177 (1-2): 207–16. ^ Li Z, Huang M, Ichikawa J, Dai J, Meltzer HY (November 2005). "N-desmethylclozapine, a major metabolite of clozapine, increases cortical acetylcholine and dopamine release in vivo via stimulation of M1 muscarinic receptors". Neuropsychopharmacology 30 (11): 1986–95. ^ Olianas MC, Dedoni S, Ambu R, Onali P (April 2009). "Agonist activity of N-desmethylclozapine at delta-opioid receptors of human frontal cortex". European Journal of Pharmacology 607 (1-3): 96–101. ^ a b Bishara D, Taylor D (2008). "Upcoming agents for the treatment of schizophrenia: mechanism of action, efficacy and tolerability". Drugs 68 (16): 2269–92. ^ Mendoza MC, Lindenmayer JP (2009). "N-desmethylclozapine: is there evidence for its antipsychotic potential?". Clinical Neuropharmacology 32 (3): 154–7. ^ Natesan S, Reckless GE, Barlow KB, Nobrega JN, Kapur S (July 2007). "Evaluation of N-desmethylclozapine as a potential antipsychotic--preclinical studies". Neuropsychopharmacology 32 (7): 1540–9.